LIMITED TIME DEAL: Use code SUPERMOM to save 20% off any multi-month subscription! The info sheet doubles as a poster! I love the boho flower crowns on all of the characters. I love collecting tote bags! I like to think it’s a relatively practical hobby since I end up using my totes as purses, grocery bags, and even laundry bags on occasion. This cute canvas bag will be perfect for spring/summer farmers market trips with its retro, flower-child vibe. There are designs on the front AND back of the bag, which is rare, and the designs on the back are made to look like patches that have been embroidered onto the fabric. How sweet! This BPA-free mug features a silicone lid and removable sleeve to keep your fingers from getting too warm. The pattern follows the same aesthetic as the box and the tote bag. I love how cohesive everything in the box is! This mug will make my morning tea or afternoon coffee a lot more fun. I love this idea! Patches are really in right now, but they’re kind of a hassle to add to bags and jackets. (You either have to sew ’em or iron them on.) They’re more permanent, too. These patch designs have safety pins attached to the back so that you can still get the look of embroidered patches without having to permanently alter your bag or clothes. Each pin is a little over an inch big, so they’re perfect for adding a small but super charming accent to your look. I love the ’90s style “dad hat” trend, but I don’t always love how canvas caps make my head look. If they’re too thin or shapeless, they make my head look a little small and weird. This hat, by comparison, is exactly what I’d want in a baseball cap! It’s surprisingly soft, and the baby blue color pops in a really cool, springy way. More importantly, the front of the hat has enough structure to it that it stands up a little bit—maybe not as much as super cool flat-brim hats do, but enough that it has some perk and life to it. According to the info poster, subscribers either got this hat or a pink My Melody version. I looooove Chococat, and I’m a big fan of blue, so I’m thrilled with this style! How cute!!! I’m always cold, so a sweatshirt is a great pick for me, even in a spring box. The pretty pastel palette of this classic gray crewneck makes it just the thing for spring evenings when the temperature cools down. The design on the front of the shirt matches the pattern on the tote bag, and on the back hip, there’s an illustrated mushroom patch for an extra bit of adorableness! Here’s me in my retro Sanrio spring outfit! This look makes me feel like I’m the coach of the cutest neighborhood softball team ever!!! I love the design of this My Melody stamper, though I kind of wish it had come with an ink pad. I think it’s intended almost as a bonus item (it’s the only piece that doesn’t follow the boho flowers design scheme), so I’m not too surprised that it feels less impressive than the other finds. Verdict: This box RULES. As a Sanrio fan, I’m swooning for the 5 exclusives (and one bonus item) in this box. As I mentioned in the review, I love how cohesive all of the items feel—the style/design is all the same and the quality level, more importantly, feels consistently great from item to item. I guess the consistent design could be a bummer if you’re really not feeling the boho vibes. For instance, if the design scheme only appeared on the tote bag, you’d still have 4 other items that might fit your tastes better. But for me, it’s all good! I love that the pieces are exclusive, too. I’m not left with the feeling that I could find the items at a local toy store or Japanese gift shop. Coupon – Use code SUPERMOM to save 20% off any multi-month subscription! Value Breakdown: At $42.99 for this box, for five items (not counting the bonus item), you are paying about $8.60 each. What do you think of the spring Sanrio Small Gift Crate? I am SO upset!!! I finally decided to get order this subscription solely for the sweatshirt, then had to wait that much longer because of the delay, only to get it and mine has a rip in the neck of it, as if someone accidentally sliced through it with a razor blade. Huge disappointment! I emailed the company and hoping for a replacement. Wow, not a single mention of the two month shipping delay or the obvious downgrade in products? Super upgraded Sanrio box, now biannnual! But don’t worry fans of our original promised, we still charge quarterly just like when we sent out a box every three months. Maybe it was because of the delay, but I was pretty disappointed in this box. The tote bag and sweatshirt are print on demand type items. In contrast, last summer’s box had a unique and high quality vinyl bag. Pusheen’s sweatshirt was made from Pusheen fabric. That is the kind of customization that will forgive a two month delay. I haven’t worn a baseball cap since team sports in elementary school. I liked the cup but have yet to see if it holds up. The pins are good too. I was disappointed too. I felt everything in the box was a significantly lesser quality than previous boxes. The hat reminds me of my 9 year old self in the 90s and the sweatshirt is soooo past season with it now reaching into the low 90s outside. The other two items I didn’t like either. They just feel cheap…and compared to the mug and water bottle I just got from the Hello Kitty cafe truck this mug is a super let down. I’ll be giving it away. I really hope the next box doesn’t take so long and that it’s back to normal. I would love to buy the Chococat hat! I got My Melody, which is adorable, but really want Chococat. If anyone would like to sell the Chococat hat to me, I would be so happy. It’s cute, not my favorite box though. I got the chococat hat and my daughter loves it. Hehe! TOTALLY fair comment! 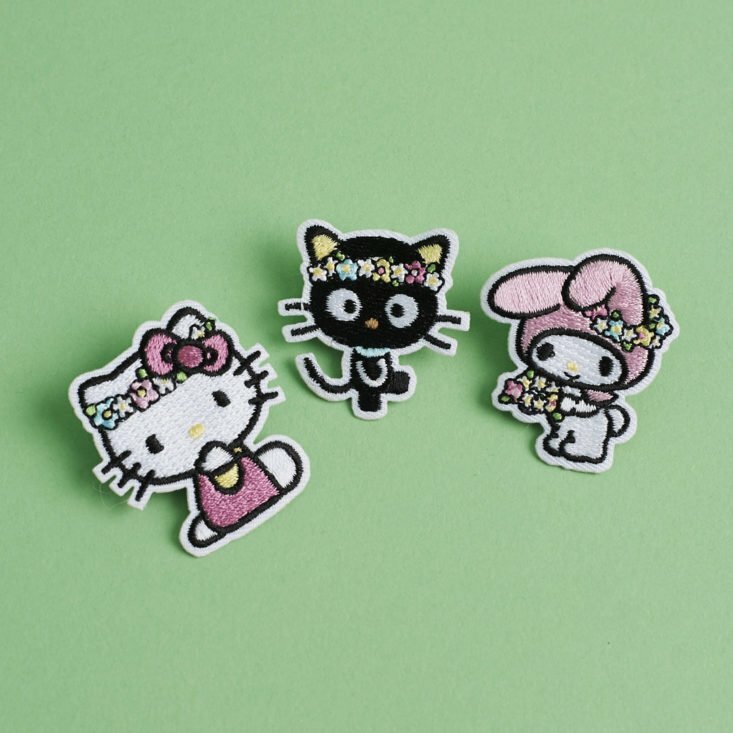 Is it even stranger that I don’t like flower crowns for myself, but I kind of love them on Sanrio characters? I’ve never put a flower crown on my head that looked… good. Hahaha! But I think Chococat looks great! Finally got my box today after that dreaded shipping delay. I wonder if the piece that they had quality control issues with was either a figurine or plush since all the prior Sanrio small crates had one or the other in it. With that being said, I just want to say how much I love not only this quarter’s crate, but the entire collection,/series so far (the food themed one was my least favorite,but everyone has their own preferences so to each their own with no hate). Also just a f.y.i….not sure if you know this after reading your comment about the mini stamp trinket, but it’s a Sanrio in store(at least here in the U.S.). Whenever you purchase something, the top of the Sanrio shopping bag is usually is folded over and sealed with a cute Sanrio character sticker. Attached to the bag with the sticker is some sort of small, usually plastic, Sanrio trinket. They aren’t expensive looking and not everyone has a function outside of just looking cute. Getting one that is an adorable stamp is an added bonus, so you definitely wouldn’t expect any stamp ink to accompany it. With that being said, you also wouldn’t expect for the trinket to follow the box’s theme since in store traditionally there’s no correlation between the trinket and your purchase(s). That hat. Chococat with the flowers on his head. Oh. Em. Gee. The cute factor is through the roof!!! I will get one from eBay. Hi there! I am desperately seeking someone to swap hats with! I got My Melody and I was really hoping for Chococat! If anyone who got this box would like to swap let me know! I’ve turned replies for this post on, thank you! Well I still have yet to get mine. Just throwing out there since this post completely ignores the fact that this box was supposed to arrive in MARCH. If you’re not into that trend, I can definitely see being a little let down – especially because it’s one of the bigger items in the box. Thanks for sharing your take, Rugby!